As far back as I can remember, the Pearson’s Candy Company has been part of the lore of our capital city. I sold Salted Nut Rolls for Cub Scouts back in the day. In the book, Until They Bring The Streetcars Back by local author, Stanley Gordon West, a Nut Goodie actually winds up saving a character’s life. In fact, I don’t think that there is anyone in Saint Paul over the age of 30 who doesn’t have some sort of nostalgic memory associated with the Pearson’s brand of candy. So, it makes total sense that eventually there might be a beer inspired by one of the iconic sweets from Pearson’s. 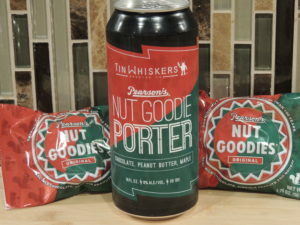 Little did we know it would be Tin Whiskers Brewing Company who would seize the opportunity to partner with Pearson’s to bring us a fantastic beer called the Nut Goodie Porter. 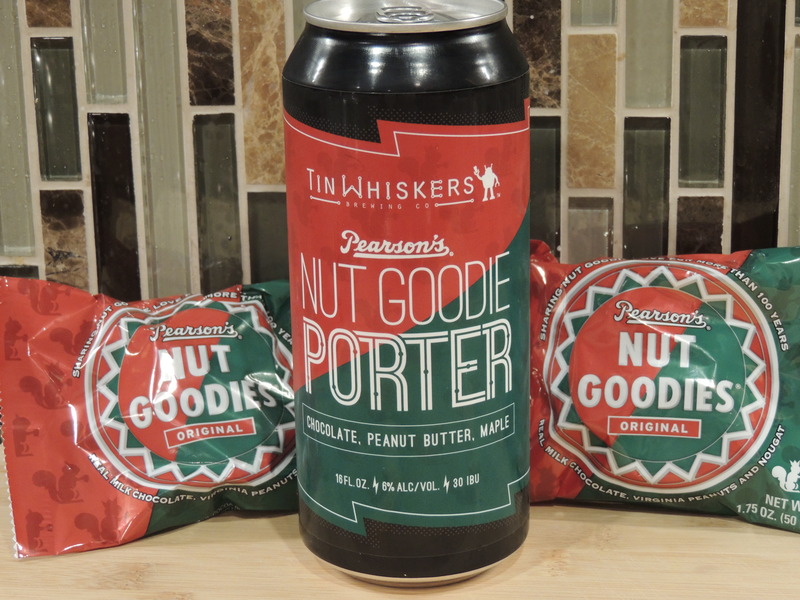 Well, recently, the fruits of a partnership between Pearson’s and Tin Whiskers Brewing Company gave us a delicious dessert-inspired beer, the Nut Goodie Porter. 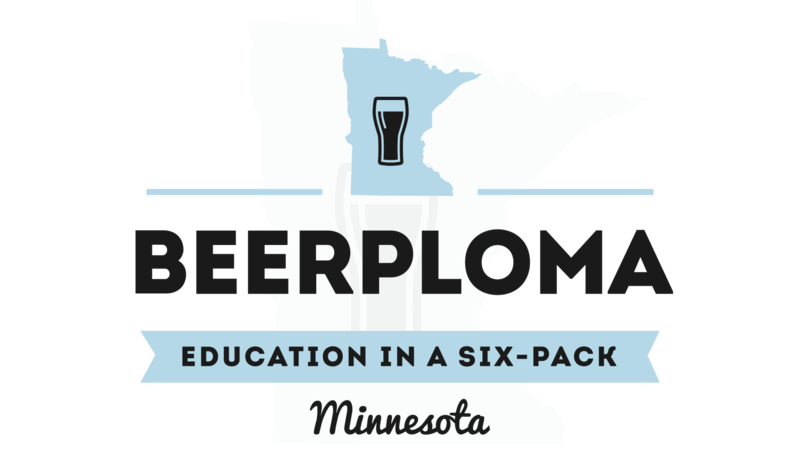 The tale of this partnership is really as simple as Andy Bobst, the Marketing and Taproom Manager at Tin Whiskers, reaching out to Pearson’s about the possibility on working together. Andy says that he literally just reached out through the Pearson’s online info email. Andy said that they were ecstatic about the possibility of putting something together. The recipe for the beer is the brainchild of Tin Whiskers Brewing Company’s cellarman, Herman Hauglid. Herman brings a sense of balance to this beer, which I assumed might be a little on the sweeter side. If you eat a Nut Goodie along with the beer, you will notice that Herman really nailed this one. It has a great roasted malt aroma that is nutty and enticing. The chocolate notes are there as well as some notes of peanut butter and maple. 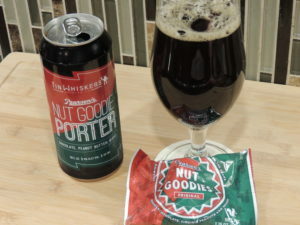 Perhaps one of the best things about the Nut Goodie Porter is that it is a 6% ABV beer so you can have a few and not “misplace” your pants. To say that this beer has been a success is an understatement. As of Tuesday, Sept. 16th, they were on the last keg in the taproom and all the cans out in the wild had been snatched up. Fear not, Tin Whiskers Nation, they are already working on brewing more batches for cans and draft. Andy Bobst thought it would be a popular beer, but he had no idea how fervently the masses would embrace this beer. I also think that it is due in part to the eye-catching labels on the cans that look almost identical to the Nut Goodie Wrapper. The Nut Goodie Porter is just another in a string of successes that Tin Whiskers has been enjoying. The nice thing is that the partnership between Pearson’s and Tin Whiskers is not just a one-time thing. I am confident that we can look forward to some other things coming down the road between these 2 Saint Paul stalwarts. If you want to hear my podcast interview with Andy Bobst, click on the below. Prost! Listen to “A One Pint Stand Episode 31- Tin Whiskers Brewing” on Spreaker.